The bridges are needed to replace two ageing crossings that have connected LF Wade International Airport with the capital city Hamilton to the west and the town of St George’s to the east for over 50 years. In December 2017, a UK-based team of Ramboll (lead consultant), Knight Architects and Eadon Consulting won the contract to deliver full design services for the two replacement bridges. The feasibility options were submitted to the government of Bermuda this summer; the project team’s designs were approved last week and have now been unveiled at a public information session. Detailed designs will be drawn up over the next six to nine months, with construction expected to begin in summer 2019 and completion anticipated by 2021. 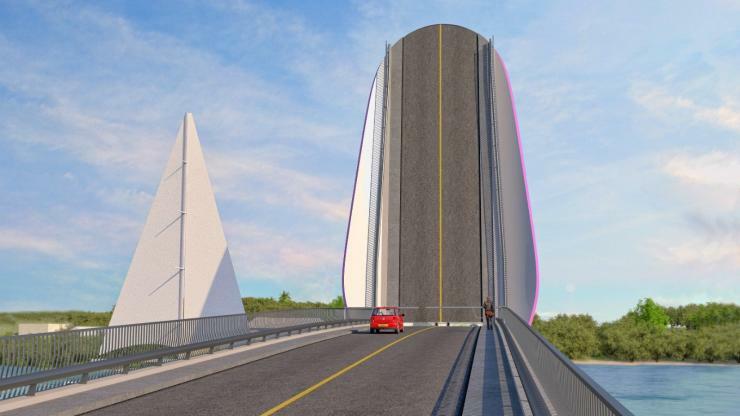 Swing Bridge will be replaced by a bascule bridge with a distinctive curved soffit, providing a 22m clear channel for shipping access to St George’s harbour. The existing 1960s bridge no longer opens for passing boats, blocking off shipping access to the harbour. 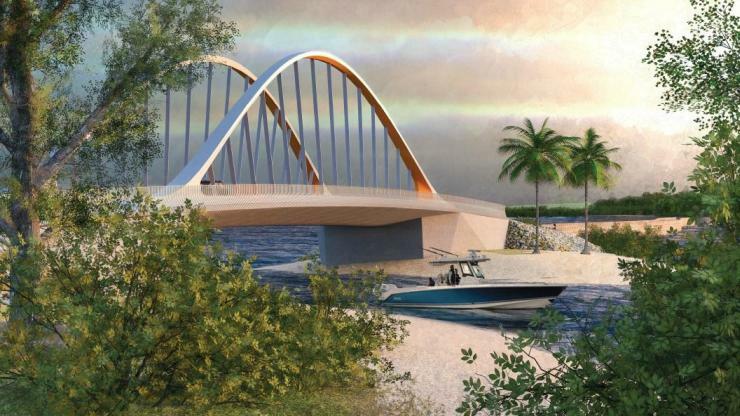 The replacement Longbird Bridge will be a 54m fixed twin-arch structure. The original 60m twin-carriageway bridge closed to traffic 10 years ago when it was bypassed with twin Bailey bridges. The designs of the two bridges follow a set of overarching visual characteristics intended to define them as a “family”, even though they are quite different from each other. Each bridge has a curvaceous appearance and both will be finished in a pale grey, with soft tones of orange or pink to accentuate their forms and reference the distinctive palette typical of buildings throughout Bermuda. One of the factors behind the curved design is to minimises the collection of water on the bridges to help resist the corrosive effects of the tropical maritime climate. Martin Knight, director at Knight Architects, added: “These bridges, so vital in the daily lives of Bermudians, will also form distinctive landmarks to people arriving at the international airport and have been conceived to make a positive contribution to the tourism identity of this extraordinary place."